The NCAA tournament opens the door for 64 teams to compete for a chance to win a championship trophy, title and monetary prize. With so much up for grabs, students, faculty, staff and surrounding supporters weigh out the odds to consider whether or not Hampton University has a chance at winning. “We actually could win this game, I can’t say why I just know that we can,” said Julian Washington, a second-year architecture major from Chatham, Virginia. “We’re already known as the underdogs. We’ve proven our point before so I believe we have a chance at winning,” said Terrance Harmon, a junior architecture major from Orlando, Florida. However, Donovan Rose Jr., a 2nd year 5-year MBA student from Yorktown, Virginia begged to differ. “I don’t think we have a chance of winning, but I believe it will be competitive. We’re not going to get blown out like the analysts may think.” Darrell Gunter, a former athlete of the Hampton Roads area, still follows the team closely and shared his thoughts. Although there can only be one winner, making it to the NCAA tournament is still a major accomplishment, and is very beneficial to the Pirates and the University. According to Forbes.com, this year each team that makes it to the first round of the NCAA tournament will receive $1.9 million for their respective conference, whether they win or lose. This means the Pirates have already benefited financially from the tournament. But where does that money go? Eugene Marshall Jr., Hampton’s Director of Athletics, shed some light on where the money goes. MEAC champion and No. 16 regional seed Hampton Pirates will play No. 1-seeded University of Virginia Cavaliers of the ACC on Thursday in Raleigh, North Carolina. Can Hampton pull off a miracle upset? A No. 1 seed has never lost to a No. 16 in the first round since the tournament expanded to 64 teams in 1985. A No. 16 seed has yet to pull off the big upset, but it has almost happened several times. There have been 15 No. 16 seeds that stayed within single digits against a No. 1 seed. The most recent was in 2014 when Weber State kept the game close against Arizona before eventually losing 68-59. Two No. 16 seeds came within one point of defeating a No. 1 seed in 1989. No. 1 seed Georgetown hung on to beat Princeton 50-49. Oklahoma had to overcome a 17-point deficit and sweat out a last-second half court shot to beat East Tennessee State 72-71. However, No. 2 seeds have lost to No. 15 seeds. How many No. 15 seeds have defeated No. 2 seeds in NCAA Tournament history? The answer is seven. No. 2 seeds have a record of 113-7 against No. 15 seeds, meaning No. 15 seeds win just 5.8% of the time. 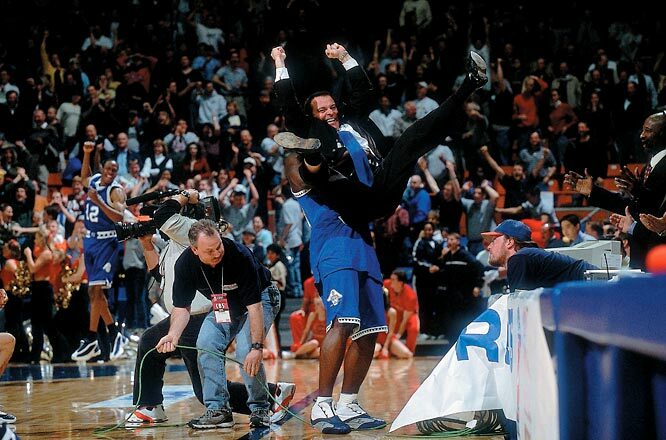 In 2001, our very own HBCU achieved what was said to be one of the greatest upsets in tournament history comes. When No. 15 Hampton took on No. 2 Iowa State, the Cyclones had Big-12 Player of the Year and future NBA player Jamaal Tinsley on their roster. Head Coach Steve Merfeld led the Pirates to a 25-7 record and the regular season and MEAC Titles. Throughout the back and forth game, the Pirates went on a 14-2 run in the second half to beat the Cyclones, 58-57.